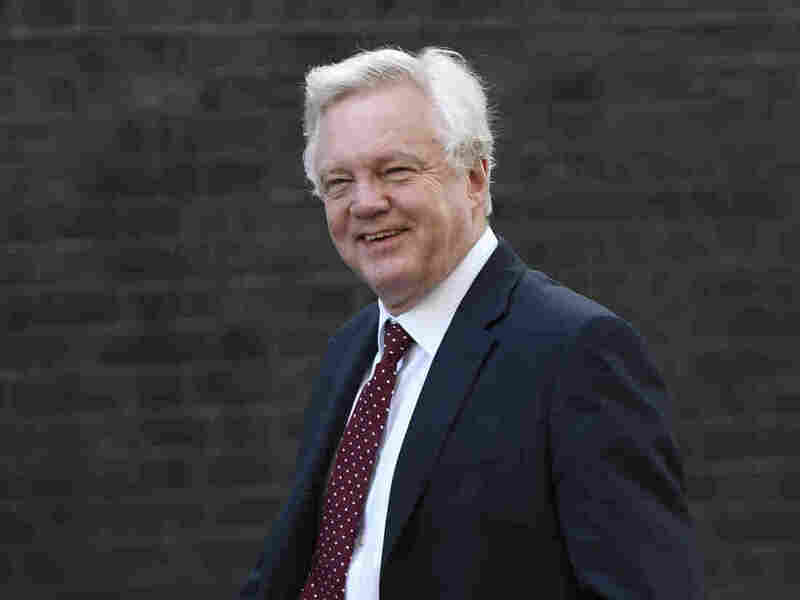 Britain's Brexit Secretary Abruptly Quits, Throwing Deal To Leave EU In Doubt Days after Prime Minister Theresa May's Cabinet hammered out a proposal for leaving the bloc, Brexit Secretary David Davis is stepping down, saying the plan leaves the U.K. in a weak position. Davis said the so-called "soft Brexit" plan, which proposes maintaining a "UK-EU free-trade area," would leave the U.K. in, "at best, a weak negotiating position and, at worst, an inescapable one." "This is painting something as returning sovereignty, returning control, to the House of Commons, when in practice it actually isn't doing so," Davis said. Later, it was announced that Brexit campaigner Dominic Raab had been tapped to replace Davis. Davis' departure comes just nine months before Britain is scheduled to leave the EU and 15 weeks before a final deal is to be signed. "There have been differences within the Conservative Party over how far the UK should prioritise the economy by compromising on issues such as leaving the remit of the European Court of Justice and ending free movement of people. Mrs May's Conservative Party only has a majority in Parliament with the support in key votes of the 10 MPs from Northern Ireland's Democratic Unionist Party, so any split raises questions about whether her plan could survive a Commons vote - and has also led to renewed questions about whether she will face a challenge to her position." Davis' resignation was followed by that of Exiting the EU Minister Steve Baker. As Reuters writes, "It raises questions over whether [May] can sell her plan to Britain's equally divided parliament and may embolden those wanting to unseat her." The Independent adds, "Davis's resignation allows the Brexit irreconcilables to think that there must be a better way, even if it means leaving the EU without a deal. That is a prospect that now seems more likely. It has been worrying the prime minister's advisers from the start."